Fancy a quick getaway in Palmerston North? With the weather in Palmerston North settling into the perfect time for sight seeing and relaxation you should look no further and start packing! 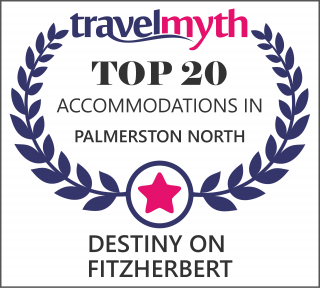 Here at Destiny of Fitzherbert, we would like to give you a warm summer welcome to some of our most beautiful and stunning attractions Palmerston North has to offer. If you are a fanatical rugby fan or just curious about our national sport, our Palmerston north motel is only 12 minutes walk away from the New Zealand Rugby Museum. In there you will find some of the historical records and biographies of some of the most recognised All Black's rugby players that have ever graced the game. The rugby museum is family friendly and if you are a member, admission is free. For the more creative and artistic folks, we have another 12 minutes walk from our motel to the Te Manawa museum, it is an art gallery and also a science centre (Interesting combination eh?). It can be overwhelming at first, but once you start exploring the museum, you will soon realised how articulated and fun it is for you and your family. They have heaps of activities lined up monthly, ranging from arts exhibitions, community events and also their regular trip to Te Awa river where you get to feed their native fish! Too many indoors activity you say? Well, Palmerston North is well known for their famous Manawatu Gorge (16 minute drive from our motel, unless you plan on walking) and Ruahine Forest Park (an hour and a half drive from the motel, highly recommend getting there on wheels!). Both attractions are to the northeast of Palmerston North. You will find yourself surrounded by magical and lush scenery in mother nature's time inducing work and taking in the ambience and sound that will make you feel at peace. Havn't convinced you yet? Look on Palmerston North's tourism website to find something that will.